All matter is made of atoms. The atoms found in a solid are more tightly packed together than the atoms in a liquid, which in turn are more tightly packed together that the atoms in a gas. However, atoms are mostly empty space. They are made up of the nucleus (neutrons and protons) and electrons. 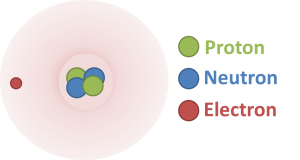 We often use diagrams such as this one to describe the positioning of the nucleus and the electron, but in fact there is a lot of space between the nucleus of an atom and its electrons. How much space you ask? The simple answer is a lot… a lot lot. Electrons are located at increasing distances from the nucleus in regions that scientists call shells or orbitals. Each shell only has space for a limited number of electrons. The first shell can hold up to two electrons. The second shell can accommodate up to eight electrons, and so on. It’s important to remember that electrons don’t circle the nucleus the way that planets orbit the sun. Picturing them like this simply helps us to understand how they behave. In the incredibly small world of the atom, the laws of physics used to describe larger objects don’t always apply. Because of this we can’t pin down exactly where a given electron will be at any particular moment. Scientists use the laws of probability and statistics to work out where an electron is most likely to be. The shape of this probable area forms what is known as the electron cloud. This cloud is made up of a bunch of snapshots that shows where the electron is most likely to be from one moment to the next. The darker parts of the cloud are the areas where the electron will be the vast majority of the time. This is the electron shell. The lighter parts of the cloud show the areas where there is a very small change of being located at any given moment. So while the exact location of a given electron can vary slightly from one moment to the next, scientists have developed a range that house the electron 99% of the time. This is a lot to take in, but the simple point is that atoms are made up almost entirely of empty space. There are a few simple analogies used to describe the size of this space. My favorite asks the reader to imagine a large football stadium. The nucleus of the atom is a fly in the center of the stadium and the electron is a gnat circling the parking lot. Like I said… a lot of space. So the next time you weld together two carbon steel plates, remember, even though they look and feel solid, they are actually composed, almost entirely, of empty space. Now who is going to tell me that’s not cool? Next week: If all matter is made up of almost completely empty space, why can’t my hand pass through the weld I just made? Good question! Come back next week and I’ll explain why. The answer is pretty wild. I’ll leave you with this thought: the reason you hand will not pass through a weld you just produced, is the reason why you don’t fall through the floor, and the same reason why you will live your entire life without ever really touching anything. See you next Friday! We are adding a new section to Science Fridays in which we showcase some of the most interesting or important news stories from the worlds of science, technology, engineering, and math. Amazon.com founder and CEO, Jeff Bezos recently began funding a deep-sea excavation project to locate and retrieve lost pieces of Apollo Mission rockets, specifically the Apollo 11 mission which landed Neil Armstrong and Buzz Aldrin on the moon. This week he announced that they had identified and retrieved a series of F1 rockets from the ocean floor, about three miles below the surface of the water. This is not only an important part of science history; it is an important part of welding history too. For more information on this expedition, feel free to browse Jeff’s Blog at: http://www.bezosexpeditions.com/updates.html.